[eBook] Watch It, Read It, or Tweet It. Americans’ news consumption and sharing habits are changing almost as quickly as the news outlets themselves. At the same time, we’re sharing our entire lives online through social media and blogs. And those same channels are sprouting new types of media properties whose online audiences dwarf those of our nation’s top newspapers. 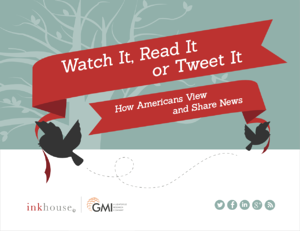 Exactly how much has changed when it comes to how Americans read and share the news? We wanted to know, so InkHouse and GMI, a Lightspeed Research Company, teamed up on a study of 1,000 Americans ages 18 and over to separate the hype from the reality. Download your free copy by completing the form.